and a bronze cast replaces it at Or San Michèle. The cause of this transfer is understood to be a fear that the statue would be ruined by exposure, although one would think that this would apply still more to the exquisite relief, which remains in situ, though unprotected by the niche. In the side-lighted Bargello, the St. George is crowded into a shallow niche (with plenty of highly correct detail) and is seen to the utmost disadvantage; but no incongruity of surroundings, no false relations of light can destroy the profound impression left by this statue, which was probably completed about 1416, in Donatello's thirtieth year. 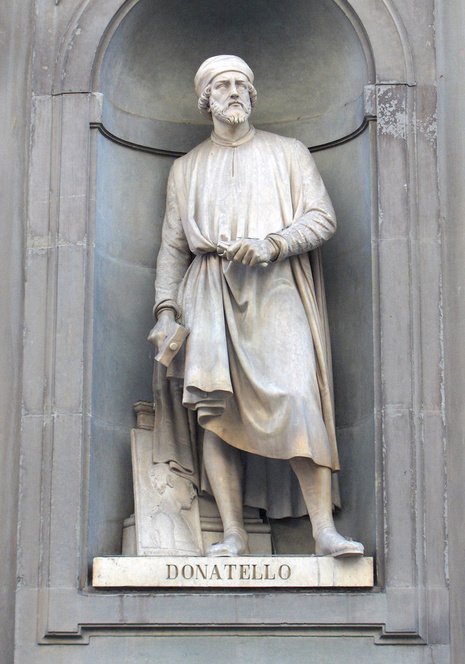 Vasari was enthusiastic in its praise. Bocchi wrote a whole book about it, in which we might expect to find valuable information; but the interest of this ecstatic eulogy is limited. Bocchi gives no dates, facts or authorities ; nothing to which modern students can turn for accurate or specific knowledge of Donatello. Cinelli says the St. George was held equal to the rarest sculpture of Rome, and well it might be. The St. George was made for the Guild of Armourers; he is, of course, wearing armour, and the armour fits him, clothes him. It is not the clumsy inelastic stuff which must have prevented so many soldiers from moving a limb or mounting a horse. In this case the lithe and muscular frame is free and full of movement, quite unimpeded by the defensive plates of steel. He stands upright, his legs rather apart, and the shield in front of him, otherwise he is quite unarmed; the St. George in the niche is alert and watchful: in the bas- relief he manfully slays the dragon. The head is bare and the throat uncovered; the face is full of confidence and the pride of generous strength, but with no vanity or self-consciousness. Fearless simplicity is his chief attribute, though in itself simplicity is no title to greatness: with Donatello, Sophocles and Dante would be excluded from any category of greatness based on simplicity alone. St. George has that earnest and outspoken simplicity with which the mediaeval world invested its heroes; he springs from the chivalry of the early days of Christian martyrdom, the greatest period of Christian faith. Greek art had no crusader or knight-errant, and had to be content with Harmodius and Aristogeiton. Even the Perseus legend, which in so many ways reminds one of St. George, was far less appreciated as an incident by classical art than by the Renaissance; and even then not until patron and artist were growing tired of St. George. M. Reymond has pointed out the relation of Donatello's statue to its superb analogue, St. Theodore of Chartres Cathedral. "C'est le souvenir de tout un monde qui disparaît." Physically it may be so. The age of chivalry may be passed in so far that the prancing steed and captive Princess belong to remote times which may never recur. But St. George and St. Theodore were not merely born of legend and fairy tale; their spirit may survive in conditions which, although less romantic and picturesque, may still preserve intact the essential qualities of the soldier-saint of primitive times. The influence of the St. George upon contemporary art seems to have been small. The Mocenigo tomb, which has already been mentioned, has a figure on the sarcophagus obviously copied from the St. George; and elsewhere in this extremely curious example of plagiarism we find other figures suggested by Donatello's statues.